NEAR MARJAH, Afghanistan (AP) — U.S. and Afghan soldiers linked up with Marines on the outskirts of the Taliban stronghold of Marjah on Thursday, sealing off escape routes and setting the stage for what is being described as the biggest offensive of the nine-year war. “They’re trying to draw us in,” said Capt. Joshua Winfrey, 30, of Tulsa, Okla., commander of Lima Company, 3rd Battalion, 6th Marines. 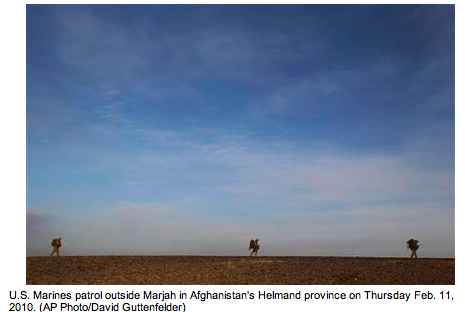 Up to 1,000 militants are believed holed up in Marjah, a key Taliban logistics base and center of the lucrative opium poppy trade. But the biggest threats are likely to be the land mines and bombs hidden in the roads and fields of the farming community, 380 miles (610 kilometers) southwest of Kabul.